How the oceans specifically function, particularly with regard to interactions with climate, is still misunderstood to a great extent. Measurement data is primarily what is missing. An international project endeavours to change this – despite the varied interests of the participating nations. What is the basic idea behind the Project AtlantOS? We are being confronted with the big challenge that, in order to answer more and more scientific and societal questions, information from the ocean is required. And not only selective information – we need as much comprehensive and long-term information as possible. For this purpose, we need improved international, coordinated and interdisciplinary collaboration. How can this data best be collected? With three methods: First, through observing systems from satellites. The temperature of the ocean’s surface and sea-level height can thus be measured – but no observations can be made beneath the surface. For this purpose systems are required that operate on site in the ocean. And in order to bundle, optimise and improve the various approaches, the AtlantOS project was initiated. Which technologies are applied there? This begins with research vessel tours, in which one is able to take selective and highly precise readings with probes. But you can imagine that the number of research ships is not unlimited, and that the costs are comparably high. This mode of measurement can be optimised and complemented through two different methods: We would prefer to have on board every commercial ship a “measurement module” for continuous measurements regarding salt content, pH value, dissolved CO2, nutrients, concentrations of plastic, abundance of plankton and marine genetic diversity. We could also record the currents in the upper 500 metres, and many more important surface parameters. This will require a few more years until we have brought together the proper, large commercial partners. The second large segment comprises autonomous systems – robot-like platforms. There has been tremendous progress in this regard in the last ten years. Are you talking about the so-called Argo-Network? Yes, it consists of almost 4,000 robots that move around everywhere in the ice-free ocean to take continuous readings of the upper 2,000 metre water column. More than 30 countries are participating in this programme. The data are made available to the entire world free of charge in real time. We can envision the future with such projects involving international collaboration. The same is true of the gliders, for example, that the Helmholtz Centre operates. 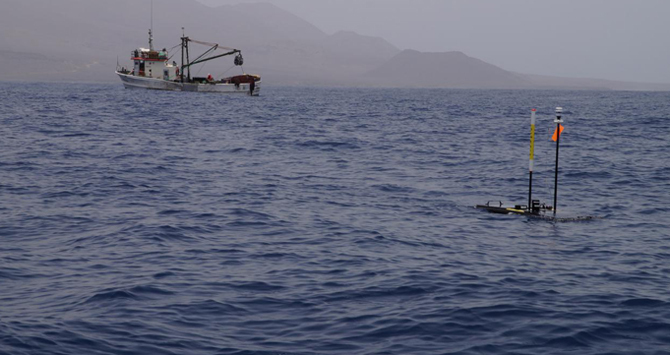 These are robots that are in motion not only up and down, but they can also move forward a bit by sailing along the surface. We also possess miniature submarines for deep-sea measurements that require much more energy and cannot be operated continuously without research ships nearby. AtlantOS gauges the various technologies: Which one is most suitable for which measuring purpose in the ocean, which mixture of observing systems are needed in the ocean? France, Great Britain, Canada, the USA, Brazil, South Africa and Argentina among others are involved in this network… with extremely varied interests. How can you accommodate all of them at the same time? It is true that all nations also have their own particular interests in the ocean. But they all know as well that their resources for ocean observations are limited. And this means that it is logical to make use of the technological infrastructures jointly: to come to agreements, and to trade ship-use time, depending on who happens to have a research ship on site. For example, we have capacities with deep-sea submarines that other nations don’t possess. On the other hand, they might have measuring devices that we don’t have. AtlantOS promotes international collaboration and establishes methods to optimally complement themselves, and share the knowledge and data obtained. Comparatively speaking, how has awareness developed in recent years in reference to the interplay between ocean and climate? Climate research experts had been aware of the significance of the oceans right from the beginning, in comparison to the general public, relatively speaking. In recent years of course there are two aspects in particular that make this importance especially obvious. Regarding the global warming trend, it comes down to the two questions: Has a climate change taken place? Has it grown weaker? In this regard it is exciting to observe the ocean system, because that’s where 90 percent of the thermal energy gained from climate change is stored. It accumulates in the ocean – this can be measured in the meantime quite precisely thanks to Argo and the satellites. And the question can be answered: Is the system being continuously heated up or not? The signals are clear at the moment. There is and has not been an interruption in the process of global warming; the ocean stores more energy every year and is also rising in temperature at extreme depths. And what is the second aspect? That’s the sea-level rise. It can be seen very clearly via satellite, but there are still many questions open regarding the regional signals and their repercussions for the coastal systems. The regional sea-level rise varies quite a bit, depending on where and how the global warming takes place, e.g. where the glaciers and polar ice sheets melt and how quickly the earth’s crust reacts to the changes in masses. There are also changes in the water balance on land and in the wide variety of protective measures along the coastlines. This is a complex, enthralling and important system. …and there it leads to chemical changes, causing the pH value to sink. After all, the ocean has become increasingly acidic (almost 30% higher already – 0.1 pH units) since the industrial revolution, and particularly so in the last 50 years. This impacts the coral reefs, snails and plankton, i.e. the food chain for fish. Taking a precise reading of the pH level in the ocean is not as easy as it sounds. The first robots with pH sensors have been operating in a pilot programme for a few years now. The quality and changes in the plankton can only be definitively determined by using nets. But there are also semi-automatic systems that can be towed behind slower commercial ships, collecting data for the last 60 years from several shipping routes. All of these continuous measurements in the ocean are quite complex, expensive and dispersed among many ships and platforms. Neither associations, such as Leibniz Institute and Helmholtz Centres, nor countries, including Germany, could single-handedly afford the material and economic resources required for such an endeavour. It is necessary in this case to organise an international collaboration; and AtlantaOS was established in the Atlantic Ocean precisely for this reason, with similar projects for the Mediterranean, the Arctic Ocean, the Southern Ocean, the Indian Ocean and the Pacific. Another issue is the concern about the Gulf Stream – what is the current status? The issue here is the climatically relevant deep-sea circulation involving warm water which is directed along the surface to the north, while cold water at great depths flows back to the equator and the Antarctic. In this context we are speaking of a “density-driven” current: It is initiated by rapid cooling in the winter at higher latitudes around Greenland. But when glacial ice melts and flows into the ocean, the salt content decreases. This water at the same degree of cooling hence becomes less dense and less heavy. It is thus not able to sink as well as it did before. If we add milder winters due to climate change to this scenario, the double-whammy effect should cause this circulation to decrease, according to our estimations, by about 30 percent. So far, the currents at extremely deep levels are still quite stable. In my working group, we have been monitoring the strength of this deep-level circulation off the coast of Labrador for almost 20 years now. This circulation comprises 80% of the Atlantic Ocean’s heat transfer, and in this respect it represents a huge impact here. It will lead to a relative cool-down process in the North Atlantic. However, this reduction in Atlantic heat transfer will only reduce the pace of surface warming, meaning that it will become less warm. Furthermore, the ocean and, ultimately, the deep sea are absorbing a third of the carbon dioxide introduced by human beings and disseminate it. For this reason, we’ve now got numerous effects that are linked to one another. If this circulation actually does become weaker, we will notice it in many different ways: In that less CO2 will be absorbed by the ocean, and that less warm water will be transported to the north. This would paradoxically help us to compensate a bit for the climate-change induced warming on land – we wouldn’t be exposed to so much heat then. How do you deal with the fact that there are still some people who deny climate change? The facts – this warming of the ocean in particular – are now disbelieved by very few, and certainly not by scientists. What I have been hearing is rather: “What you have been measuring is indeed correct, but the explanation for it is wrong. The system is always fluctuating – that isn’t climate change.” This can be refuted, for one thing, by our long-term measurement series. But we can’t, and we don’t need to, wait another 50 or 60 years until we have definitively explained the problem. The process of learning to understand the ocean system is, in itself, an aid towards explaining this and, furthermore, science is developing increasingly better ocean and climate models. These tools allow us to simulate and explain both the fluctuations as well as the warming. The surface of the ocean reacts very slowly – with a lot of time lag. Diagnosis of global warming is not being doubted by some individuals because they are putting science itself in question; rather, it is because they are shying away from the consequences that would be necessary and rational: a society with low CO2 emissions. Since they don’t want to change their behaviour, they prefer to just dispute the diagnosis. We scientists involved in climate research are making diagnoses and predictions; in order to implement, for instance, low CO2 energy systems, we need close collaboration with other disciplines. For example this question is relevant: How can I support a growing world population in such a manner that the CO2 impact does not increase significantly? Science can only answer this question through interdisciplinary teams of physicists, nutrition experts, engineers and economists. We have such expertise at our disposal in the Helmholtz Association and should consistently pool these experts together in order to respond to such questions concerning the future. Prof. Dr. Martin Visbeck from GEOMAR Helmholtz Centre for Ocean Research Kiel and Christian-Albrechts-Universität Kiel, is an expert in physical oceanography and coordinator of the international project AtlantOS, which is currently consolidating the observing systems and data from many different partners and seeks to advance research through the use of synergies. AtlantOS stands for “Optimising and Enhancing the Integrated Atlantic Ocean Observing Systems” and is a project funded with 20 million euros under the auspices of the EU Programme for Research and Innovation, Horizon 2020. Visbeck coordinates the consortium consisting of 62 members in which 18 of them are represented. From the Helmholtz Association, GEOMAR is not the only one to participate – Alfred Wegener Institute Helmholtz Centre for Polar and Marine Research (AWI) participates as well.